Cruising Through JAF’s Summer of Fun! Remember that record-breaking winter we had in New England? Neither do we! We’ve been too busy enjoying the beautiful month of July, which we spent most of outdoors – either enjoying (Up)Beat Outings with our patient families or training for the upcoming Falmouth Road Race. But that’s not everything that kept JAF busy in July – read all about the month that was, below! Did you get shut out of the Falmouth Road Race lottery? Still looking for a bib number? The Joe Andruzzi Foundation’s Team JAF runners will once again be taking strides against cancer at the 43rd New Balance Falmouth Road Race in Woods Hole on Sunday, August 16, 2015, and we’re looking to field our strongest team ever! Do you want to run with Team JAF this year? Know someone that may? Visit our Falmouth Road Race event page and fill out our online application BEFORE THE AUGUST 1ST DEADLINE! Not running in this year’s race? You can still be an honorary member of Team JAF by cheering on our runners! Email events@Joeandruzzifoundation.org for more information on how you can get involved. To read more, please click here! Last Wednesday – for the sixth straight summer (thanks to our friend’s and sponsors at Boston Harbor Cruises!) 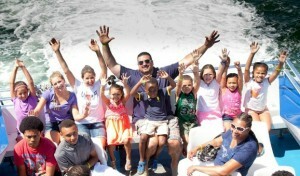 – we got to take JAF & Dana Farber/Jimmy Fund patient families on the wild and wet Codzilla Thrill Ride. The high-speed powerboat whipped around the harbor at upwards of 40 miles per hour as music blared and waves splashed, giving patients a much-deserved day of laughs and fun away from treatment. It’s days like our Codzilla outing that truly reinforce what an impact our foundation can make. Many of the families in attendance have been battling extraordinary circumstances, and to provide an (Up)Beat and carefree opportunity for them to take their mind off it is something we are so proud of! Check out this link to our Facebook page for photos of the day! Macy’s Shop For A Cause Returns! We’re excited to announce that JAF has been selected again as a beneficiary for Macy’s 10th Annual Shop For a Cause! Here’s how it works: from now until the event, JAF will be selling $5 Shop For A Cause savings passes that will grant access to ANY Macy’s store on August 29, where shoppers will receive 25% off on regular, sale and clearance merchandise, including designer brands you love, throughout the store, as well as 10% off electronics, furniture, mattresses and area rugs. JAF keeps 100% of the sales from the $5 passes, and you get unbelievable savings (plus the chance to win a $500 gift card)! It’s a win/win for everyone! Make an (Up)Beat Pledge This Summer! This Summer, please consider joining our (Up)Beat Pledge program, in which recurring monthly donations directly benefit cancer patients and their families. The need never ends, and that’s why ongoing support is so important. Available levels include Smile: up to $10 monthly; Grin: up to $25 monthly; Happiness: up to $35 monthly; Laugh: up to $50 monthly; and Crack Up: $50+ monthly. To read more about the (Up)Beat Pledge initiative, please click here! 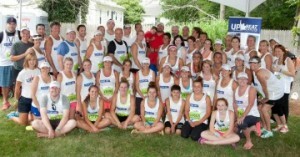 On August 16, 2015, the Joe Andruzzi Foundation’s Team JAF runners will once again take strides against cancer at the 43rd New Balance Falmouth Road Race in Woods Hole. Team JAF will join more than 12,000 runners as we gather for the scenic 7-mile run in the heart of Cape Cod – all to raise funds in support of JAF’s mission of providing help, hope and a reason to smile for cancer patients and their families. Visit our Falmouth Road Race event page and fill out our online application today before the August 1 deadline! 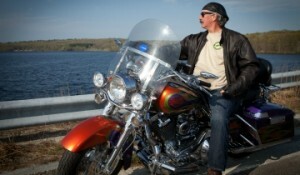 On June 9, one of JAF’s dearest supporters, Chuck Furey, set out on a 14,000-miles motorcycle ride –The ONE Ride – touching all four farthest points in the Continental United States. Chuck selected five foundations across the country to share equally in all of the charitable proceeds, including the Joe Andruzzi Foundation! On August 19, we are throwing a welcome back party for Chuck at Trinity Bar & Restaurant in Norton, MA. Check back on our Facebook page next week for details on tickets and more! Save the date-November 16, 2015! The Joe Andruzzi Foundation’s night of gratitude and celebration returns to Gillette Stadium’s Putnam Club again this November for the annual Gratitude Gala, presented by East Commerce Solutions, Inc.! Click here to learn more. Save the date! 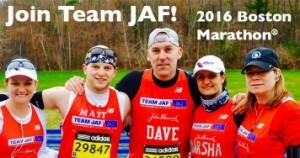 On Monday, April 18, 2016 – Marathon Monday – the Joe Andruzzi Foundation’s “Team JAF” runners will take strides against cancer at the 2016 Boston Marathon® for the sixth straight year. 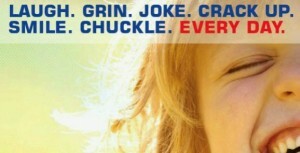 Team JAF is made up of charity runners, as well as those receiving entries through qualification or outside invitations. All fundraising by Team JAF members directly supports the Foundation’s mission of providing help, hope, and a reason to smile for cancer patients and their families. To be notified when Team JAF’s 2016 Boston Marathon application period opens, email TeamJAF@joeandruzzifoundation.org. 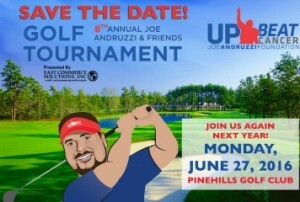 On June 27, 2016, the Joe Andruzzi Foundation’s will return to the beautiful Pinehills Golf Club in Plymouth, MA for our 8th annual Joe Andruzzi & Friends Golf Tournament, presented by East Commerce Solutions, Inc. Check back in early 2016 for details on foursomes. For questions regarding sponsorship opportunities, please contact events@joeandruzzifoundation.org. More on our event page here. JAF is grounded in our (Up)Beat Cancer mentality – an expression of who we are as an organization: fun, full of laughter and happiness. At the forefront of this mantra is our foundation’s ongoing series of (Up)Beat Outings – events and gatherings organized to help take patients’ minds off of treatment, even if just for an afternoon. So far, Summer 2015 has been jam-packed with exciting outings for JAF patients and families, which kicked-off in June with a day at Fenway Park, a Monster Jam rally at Gillette Stadium, concerts at the Xfinity Center, and the annual Codzilla Ride (not to mention Patriots Dream Camp next week). Read all about how we’re staying (Up)Beat this summer!